When deciding how to lower fats in children's diets, do not try to eliminate all fat. Certainly, children should eat a healthy diet, avoiding trans fats and processed foods; however, a child's metabolism is different than an adult's; children need a certain amount of fat in their diets to be healthy. "Getting enough healthy fats is essential for growth and development," notes KidsHealth. "Young kids, in particular, need enough of them in their diet to help the brain and nervous system develop normally." The key is distinguishing between good fats and bad fats and then ensuring that your children get enough of the former to develop in a healthy and normal way. According to the British National Health Service, the key to lowering fat in children's diets is to restrict foods high in saturated fats and replace them with healthier alternatives. NHS.UK, the organization's website, says that children consume a lot of saturated fat from such foods as butter, cheese, cakes, pastries, chocolate, hot dogs and the ever-popular pizza. "But too much saturated fat can lead to the buildup of harmful fat in the body that we can't see," especially in children, says NHS.UK. "This can cause diseases such as heart disease, Type 2 diabetes, and some cancers." The organization notes that children ages 4 to 6 should get no more than 18 grams of saturated fat per day, kids 7 to 10 should consume no more than 22 daily grams and children 11 and over should limit themselves to a maximum of 28 grams. The health agency suggests swapping out foods laden with saturated fat with healthier options rich in unsaturated fats, such as fish (especially oily fish such as mackerel, salmon and trout), unsalted nuts, seeds and avocado. The Academy of Nutrition and Dietetics, the world's largest organization of food and nutrition professionals, notes that trans fats — not all fats — are the enemy. "You want your children to eat healthfully, but what's good for you may not be good for your kids," says the organization. "In particular, adults and very young children need different amounts of fat in their diets. Fat is an important source of calories that support infants' and toddlers' growth." The AND also notes that two fatty acids in particular — linoleic and alpha-linolenic acid — are essential for a child's growth and brain development. Since the body cannot make these fats, children must get them from food. "Kids also need some fat from food to help their bodies use vitamins A, D, E and K. So don't cut back on fat for young children," says the AND. After age 2, you should ensure that children reduce saturated fat and trans fat intake — but still get enough healthy fat — by eating whole grains, fruits, vegetables, low-fat dairy and other protein-rich foods. 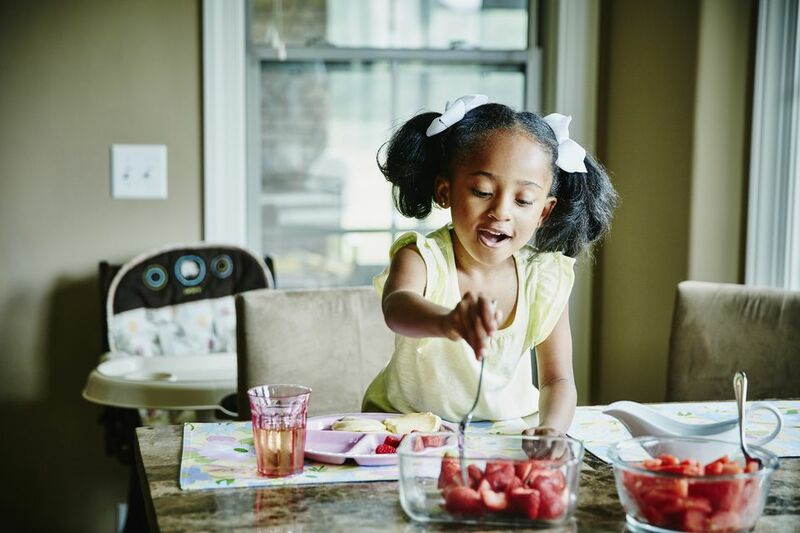 The Cleveland Clinic, one of the nation's top health institutes, advises that you talk to a dietitian — and your doctor — before making any drastic changes in a child's diet. However, the clinic notes that you can start to offer children lower-fat choices. For example, instead of regular chips, offer pretzels or baked chips; instead of a meat pizza, provide children with a healthier veggie pizza made with low-fat cheese; and instead of the all-popular hamburger, cook a grilled chicken sandwich or lean ground turkey breast burger for your children. The possibilities are extensive, and the clinic offers many other fat-lowering suggestions. Offer children fruits, veggies and whole-grain crackers at snack time instead of candy and cookies. For lunch at home or school, make whole-grain sandwiches (or wraps) with lean cuts of deli meat. Just a slice or two is all children need, not a fat-laden New York deli-style sandwich. Pack low-fat yogurts in your kids’ lunch boxes and small boxes of low-fat milk or bottles of water instead of sugary drinks. Make your own muffins and cookies instead of buying oversized fat-and-sugar-filled bakery muffins or cookies. Cook your family's meals with cooking spray or sparing amounts of either olive oil or canola oil instead of butter, shortening or lard. Talk to your children about the importance of good nutrition and healthy living. Explain how excess fat and sugar can make them unfit and ultimately sick. Lead by example. You owe it to them.